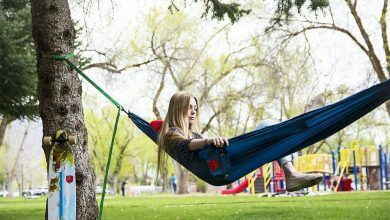 Sleeping your kids comfortably while you are on an outdoor family adventure can be more difficult than anticipated; unless you have bought them one of the best portable bunk beds. These well-thought-out beds are easy to pack and carry, considering that they are collapsible. Their portability, however, does not make them flimsy in any way, as they have proven time and again that they can withstand huge weight capacities. Besides, they are available in all sizes including for adults. Plus they come with organizers to help keep your personal belongings within easy reach. If you are here to look for one, then keep on reading. 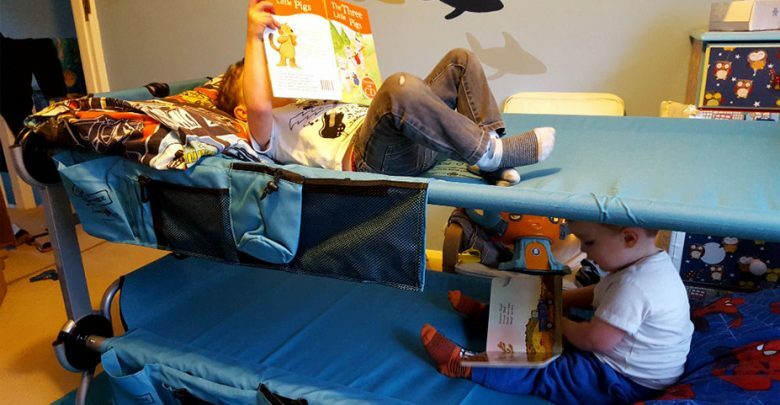 Your kid will definitely love this kid-o-bunk. It is great for kids on the go, considering that it offers a mobile sleep and seating solution. Moreover, you do not need tools to assemble it. This means your kids will be able to use it immediately they get it.The parts of this portable bunk bed come packed and stored in two convenient bags. The bags are zippered, so they can provide secure storage.Plus they are made of polyester for superior durability. They make transporting and storing the bunk bed much easier than anticipated. Given that the bunk bed is compact, super strong, modular and portable, you will find it handy for both indoor and outdoor use. The sleeping deck of this bunk bed is made of a high-grade polyester material, which offers great contoured comfort. You will not need to buy kids a mattress when you have this type of bed. This is because the comfort the sleeping deck provides is enough. In addition, the frame of the bunk bed is well made, so your kids can sleep with peace of mind knowing that the bed will greatly support their weights. The frame is made of rust-proof and powder-coated steel for maximum strength. Because of such great build quality, each cot of the bunk bed has a weight capacity of up to 200 pounds. That said, we have a feeling that this bunk bed can even be used by petite adults. It comes with two side organizers where you can keep your essentials for easy access. The four different colors (Lime Green, Red, Navy, and Teal Blue) mean you will easily find a suitable color that goes well with most of your kids’ items. Please note that the bunk bed is not for kids aged 3 years and under. Also, note that the top part is for children aged 6 years and older. While the first portable bunk bed on this list is made for kids, this one is designed for adults. This means you can buy them both for a great, convenient sleep time. When assembled, the bunk bed measures 79-by-27.75-by-32 inches. As such, expect to have a large, portable sleeping area. Furthermore, the bunk bed has a weight capacity of 500 pounds; hence, it can work for most adults. It is very easy to set up because it has a patented disc, which totally eliminates the need for assembly tools. It also features a modular disc system, which conveniently fits together, as well as disassembling and storing effortlessly. What’s more, this bunk bed comes with a compact carrying bag where you can store it after disassembling it. Another feature that has made us consider the bunk bed is steel rail system that helps enhance stability, especially when the bunk bed is set up in uneven ground. You will sleep soundly on this bed; thanks to the lack of a mid-bar, which allows for a natural and contour sleep system, similar to a bed. Given its versatility, this bunk bed can also be used as a bench on a camping trip. 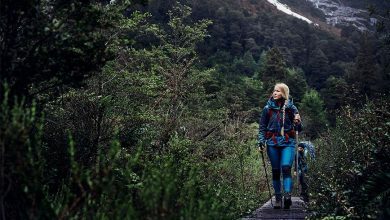 Its sleeping surface is made of a polyester fabric for incredible durability.And its frame is made of tough steel that makes it super strong to keep you sleeping easy in all of your travels. The two organizers that come with this portable bunk bed feature zipped sleeves as well as open pockets to provide you with a convenient place to keep all your personal belongings. The organizers easily attach to the sleeping deck with a loop and hook, meaning that your belongings will always be within easy reach. The bunk bed is available in 3 different color options; navy, black, and green. There are a lot of reasons why you should get your kids this portable bunk bed. First, it comes in handy when your little ones are off to a slumber party, or getting reading for the next camping trip, or going to visit grandma for Thanksgiving. In general, the bunk bed is great for summer camps, sleepovers, travel sports teams, and more. It comes with two cots, two side organizers, two carry bags, a set of stack adapters (two per bag), and two locking straps (one per bag). Each of the two cots disassembles into its own zippered carry bag to make sure that your little one enjoys all the convenience they need while they are far away from home. When you have this type of bed, you will not need a mattress or a ladder. This is because the sleeping area is comfortable enough to provide your children with a restful night’s sleep. The sleeping deck is waterproof to make sure that your kids sleep on a dry surface day in day out. Furthermore, the sleeping deck is made of a machine washable fabric, so you can easily care for it. This bunk bed is kid-friendly in that it is easy to set up and does not require assembly tools. We are also impressed that it has a patented lock-in disc system to make it unbelievably robust and sturdy. The bed sits 10 inches off the ground and boasts a gap of 18 inches between the cots. Its lime green, navy, red, and teal blue color options ensure that you have no problem settling for a suitable color. The bunk bed is not recommended for kids below 3 years, and its top section is strictly suitable for kids who are at least 6 years. Get it for your kids and let them use it either outdoors or indoors. A portable bunk bed is the perfect option for places with limited spaces. That’s why we are proud to introduce this particular one to you. It is compact, strong, and portable. For this reason, it will provide you with all the good qualities of a perfect piece of sleeping gear. Its outer dimensions measure 81.75” x 39.5” x 36.5”, and when assembled, it measures 79” x 34.5” x 32”. The bunk disassembles quickly to ensure that you are able to focus more on enjoying the comfort it has to offer and less on storing it away once you are done using it. As if that’s not enough, this bunk comes with two polyester zippered carry bags, which stow away the pieces you have disassembled. It only weighs 66 pounds, meaning it is extremely easy to carry. The lightweight construction, however, does not mean it is flimsy, as it can carry up to 500 pounds. The bunk bed also features two side organizers that help keep your essentials within easy reach. Since the bunk is made for both indoor and outdoor use, you will find it ideal for overnight guests as well as camping in the backcountry. It comes equipped with a patented disc that makes for an effortless assembly. Plus it comes with a step-by-step assembly instruction to further make the assembly process a breeze. The sleeping deck of this bunk bed is made of a high-grade polyester fabric that is firm yet will conform to the shape of your body. 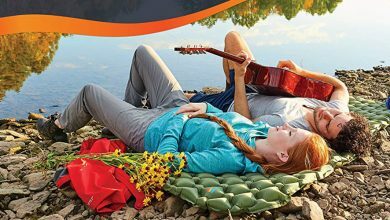 The sleeping deck has an oversized sleeping surface of 79 inches long by 35 inches wide, so it can offer optimum comfort, which, in turn, results in better night rests. 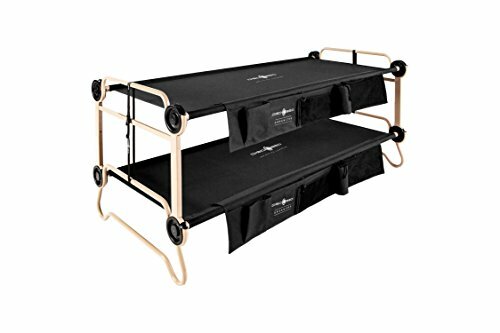 The bunk comes in two colors, which are Tan/Green and Black with Organizers. It is built with ultimate convenience; thus, we believe that it is exactly what you need. 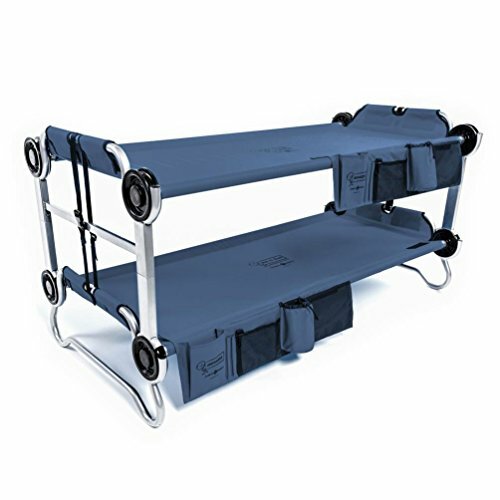 This portable bunk from Disc-O-Bed comes in two sizes; large and extra-large. The large size measures 82 inches long by 32 inches wide by 36.5 inches high. And it weighs 63 pounds. The extra-large size, on the other hand, measures 82 inches long by 39.5 inches wide by 36.5 inches high and weighs 66 pounds. 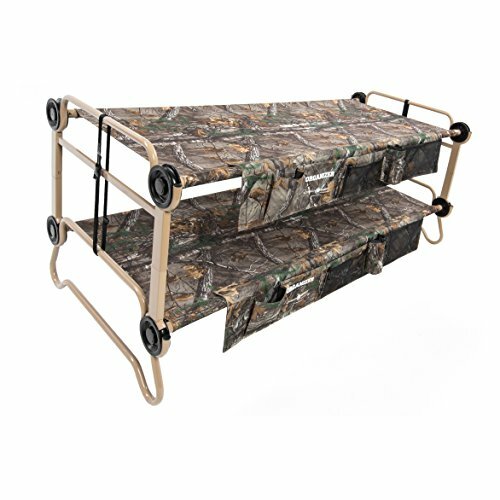 The bunk bed has a Realtree XTRA camouflage design, which makes it an innovative as well as versatile sleep solution. It also has a patented lock-in disc system for an easy, one-person assembly. Ideally, no tools are needed to assemble this bed. Plus there is a step-by-step assembly instruction that you can refer to when stuck somewhere during assembly. The frame of this bunk bed is made of steel, so you can sleep easy knowing that the bunk bed is well made. The cots are also super sturdy, given that they are made with a polyester fabric. In fact, they are so strong that each of them can hold up to 500-pound persons. The anti-rust construction means this bunk bed is built to last. Use it as a sitting bench, two single cots, or a bunk; thanks to its unmatched versatility. Although there are color options to choose from, the bunk’s Realtree Xtra camouflage design is great enough. 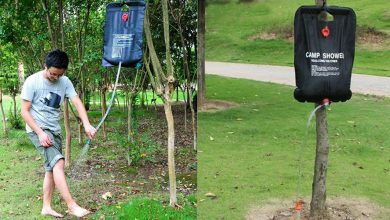 It enables it to camouflage well, and this is really important in the event that you have gone on a camping trip. The organizers of the bunk also play a huge role in keeping your essentials in a convenient place where you can access them with much ease. Disc-O-Bed has always been creative since it was formed.And that creativity has further been displayed in how this bunk bed is constructed and designed. With that in mind, you will definitely not get it wrong with the bunk bed. The following should be in your mind when buying a portable bunk bed. The weight capacity is what will make you choose one bunk bed at the expense of another. Therefore, make sure you are spot on as far as the weight capacity of your bunk bed is concerned. Try to look for those bunk beds with huge weight capacities since they are safer. The last thing you want is to spend more time assembling your bunk bed and less enjoying the comfort it has to offer. For this reason, look for bunk beds that are built with patented disc lock-in systems for easy, one-person assembly. Bunk beds can be used both indoors and outdoors. In the event that you decide to use yours outdoors, be sure to settle for a highly portable model. With that in mind, look for a bunk bed that is lightweight and disassembles quite easily. The lightweight design should, however, not affect the sturdiness of your bunk bed. If possible, your portable bunk bed should come equipped with organizers for keeping your items within easy reach. It should also have a cot that is waterproof for ultimate convenience. Moreover, it should have a feature that helps keep it stable in uneven ground. Can I clean a Disc-O-Bed Bunk Bed? Yes. Disc-O-Bed Bunk Beds have cots made of machine washable materials such as high-grade polyester fabrics. Do I need a ladder to get to the top bunk? No. All you need to do is to stand on the side rail of the bottom bunk. Once you have done that, swing one leg up and onto the top bunk. What should I do if I misplace/lose some parts of my bunk bed? Contact the manufacturer of the bunk bed. One thing you should not do is use substitute parts, as this can compromise the performance of the bed and even put you in great danger. What is the age restriction for using bunk beds? Bunk beds are not meant for kids aged 3 years and below. Ideally, the top bunk is not recommended for children aged below 6 years. Adult supervision is required if bunk bed sleepers are kids. It is no surprise that these reviews are dominated by bunk beds from Disc-O-Bed. 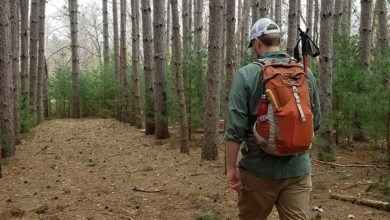 Well, this family-owned company was established in 1988, and people love their products not because the company was founded decades of years ago but because the products are easy to use, affordable, and durable. That said, we are positive that you will be a happy buyer.